Fig. 9.4. Idealisation of a shouldered tension strip. The relative size of elements directly affects the quality of the solution. As the element size is reduced so the accuracy of solution can be expected to increase since there is better representation of the field variable, e.g. displacement, and/or better representation of the geometry. However, as the element size is reduced, so the number of elements increases with the accompanying penalty of increased computational effort. Needlessly small elements in regions with little variation in field variable or geometry will be wasteful. Equally, in regions where the stress variation is not of primary interest then a locally coarse mesh can be employed providing it is sufficiently far away from the region of interest and that it still provides an accurate stiffness representation. Therefore, element sizes should be graded in order to take account of anticipated stress/strain variations and geometry, and the results required. The example of stress analysis of a semi-infinite tension plate with a central circular hole, Fig. 9.3, serves to illustrate how the size of the elements can be graded from small-size elements surrounding the hole (where both the stress/strain and geometry are varying the most), to become coarser with increasing distance from the hole. 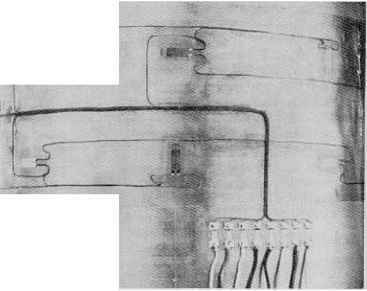 3b or can be performed automatically, e.g. the commercial package RASNA has this capability. Clearly, any increase in the number of elements (or element order), and hence dof., will require greater computational effort, will put greater demands on available computer memory and increase cost. Coincident elements refer to two or more elements which are overlaid and share some of the nodes, see Fig. 9.5. Such coincident elements should be deleted as part of cleaning-up of a mesh. A free edge should only exist as a model boundary. Neighbouring elements should share nodes along common inter-element boundaries. If they do not, then a free edge exists and will need correction, see Fig. 9.6.
line joining the corner nodes, see Fig. 9.7. The midside node's relative position should ideally be 50% of the side length for a parabolic element and 33.3% for a cubic element. An example of the effect of displacement of the "midside" node to the 25% position, is reported for a parabolic element14 to result in a 15% error in the major stress prediction. Fig. 9.7. "Midside" node displacement. 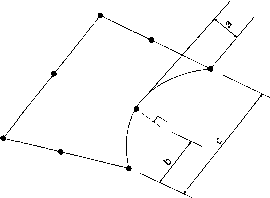 Interior angles which are excessively small or large will, like displaced "midside" nodes, cause distortion in the mapping process. 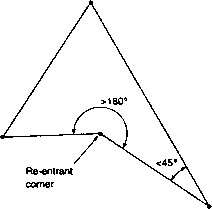 A re-entrant corner (i.e. 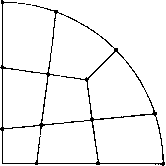 an interior angle greater than 180°), see Fig. 9.8, will cause failure in the mapping as the Jacobian matrix (relating the derivatives with respect to curvilinear (r,s), coordinates, to those with respect to cartesian (x,y), coordinates), will not have an inverse (i.e. its determinate will be zero). 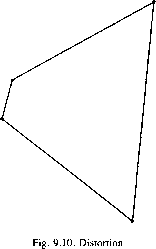 For quadrilateral elements the ideal interior angle is 90°, and for triangular elements it is 60°. Warping refers to the deviation of the face of a "planar" element from being planar, see Fig. 9.9. The analogy of the three-legged milking stool (which is steady no-matter how uneven the surface is on which it is placed), to the triangular element serves to illustrate an advantage of this element over its quadrilateral counterpart. Fig. 9.8. Extreme interior angles. 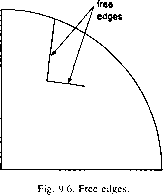 (2) the amount of elongation suffered by an element which is known as stretch, or aspect ratio distortion, see Fig. 9.11. Ideally, for a quadrilateral element, with regard to stretch, the shape should be square. + 1 is the target value corresponding to zero distortion, and stretch, etc.). Negative values, which arise for example, from re-entrant corners, referred to above, will cause an attempted solution to fail, and hence need to be rectified. A distortion value above 0.7 can be considered acceptable, but errors will be incurred with any value below 1.0. However, circumstances may dictate acceptance of elements with a distortion value below 0.7. Similarly, as a rule-of-thumb, a stretch value above 0.5 can be considered acceptable, but again, errors will be incurred with any value below 1.0. Companies responsible for analyses may issue guidelines for quality, an example of which is shown in Table 9.1. Table 9.1. Example of element quality guidelines.